Posted Tuesday, Oct 29, 2013 12:01 AM EDT by HAMILTON SPECTATOR & filed under Cancer. Today we look at colorectal cancer, the second-leading cause of cancer deaths in Hamilton. From 2000 to 2009, nearly 3,250 people in Hamilton were diagnosed with colorectal cancer and just over 1,400 people died from the disease. The rate of colorectal cancer deaths in the lower part of the former City of Hamilton is about 21 per cent higher than the comparable rate for the rest of Canada. The incidence of colorectal cancer in the former City of Hamilton was about 17 per cent higher than it was in the five suburbs of Stoney Creek, Ancaster, Dundas, Flamborough and Glanbrook between 2000 and 2009. The colorectal cancer death rate in the former City of Hamilton was 24 per cent higher than in the five suburbs. 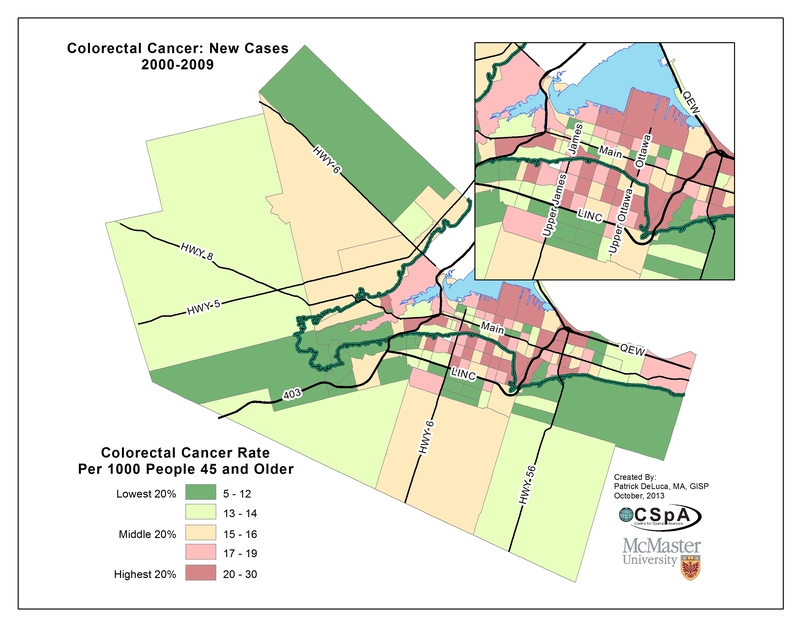 Worst: The neighbourhood between Sherman Avenue North, the harbourfront, Ottawa Street North and the rail line north of Barton Street had the highest rate of colorectal cancer incidence. Between 2000 and 2009, there were 29.9 new colorectal cancer cases for every 1,000 people ages 45 and older. That’s 95 per cent higher than the Canadian rate. Best: The west Mountain neighbourhood bounded by Garth Street, the Lincoln Alexander Parkway, Upper James Street and Stone Church Road West had the lowest rate of incidence, with 5.8 new colorectal cancer cases for every 1,000 people ages 45 and older. 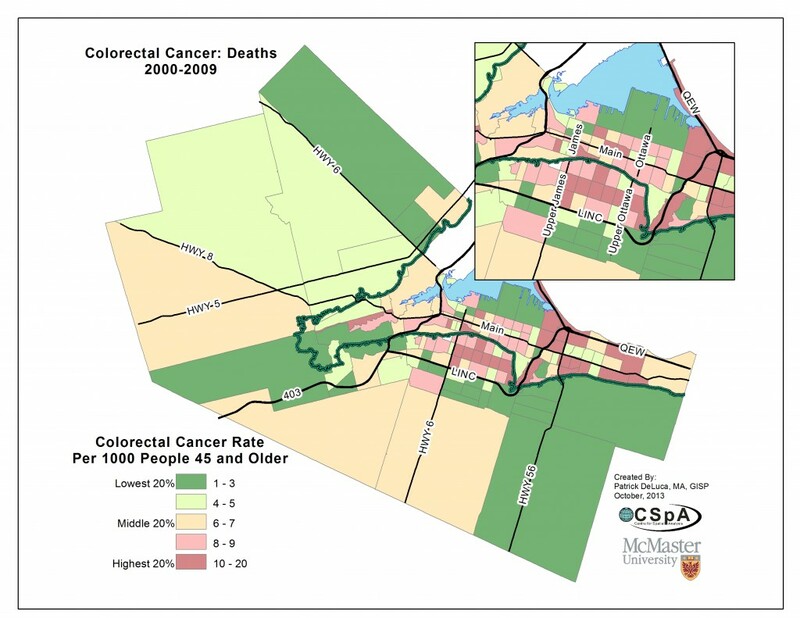 Worst: The neighbourhood between the Red Hill Creek Expressway, the waterfront, Barton Street East to east of Grays Road had the highest rate of colorectal cancer mortality, with 20 deaths per 1,000 people ages 45 and older — about three times higher than the Canadian rate. 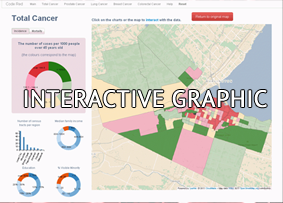 Best: The Ancaster neighbourhood bounded by Wilson Street West, Shaver Road, Garner Road and Fiddler’s Green Road had the lowest rate of colorectal cancer deaths between 2000 and 2009 with 1.5 deaths per 1,000 people ages 45 and older. Smoking increases the risk of colorectal cancer by as much as 20 per cent. People who drink alcohol regularly have a 20 per cent greater chance of developing colorectal cancer than nondrinkers. A diet with regular consumption of red meat and processed meats is associated with an 18 per cent increased risk in developing colorectal cancer. Elevated body mass is associated with a 10 to 15 per cent increase in the risk of colorectal cancer. Environment: A person’s physical environment does not appear to be strongly associated with the risk of colorectal cancer. A new DNA screening technique has been developed by German researchers that could help detect two types of genetically based colorectal cancer while the disease is in its earliest stages, including a precancerous state. The new technique could lead to treatments that would remove small areas of dangerous tissue before it develops into more advanced stages of cancer. A Harvard-led women’s health study suggests that taking low-dose Aspirin on alternate days over a long period of time can significantly reduce the risk of colorectal cancer in women.